I love Avocados in a salad and what is better than an avocado salad on a hot summer day? An avocado sandwich with veggies, hummus, olive oil and a splash of lemon. This sandwich is yummy, satisfying and will keep you light on your feet all day! Below is the recipe for two sandwiches. Spread the bottom rolls evenly with hummus. 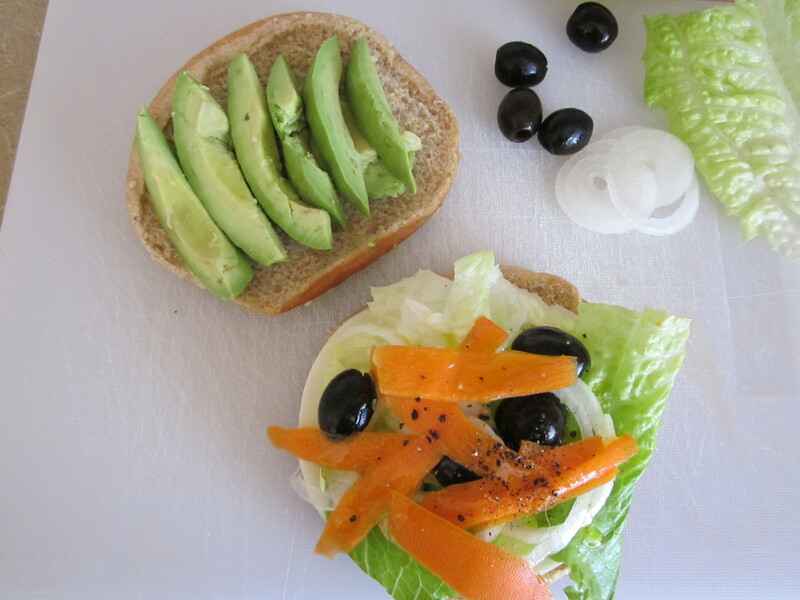 Add a slice of cheese and layer with lettuce, onions, black olives and shredded carrots. Drizzle with olive oil, and a spritz of lemon juice. Salt and pepper to taste. On the top roll layer the avocado slices and combine the sandwich halves. Makes 2 servings.